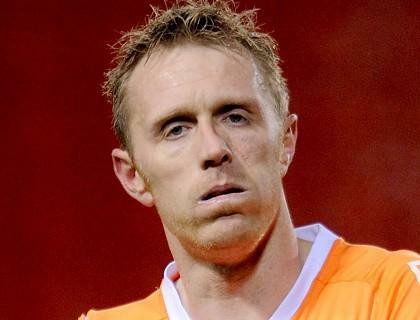 Ormerod became the first Seasiders player to score in all four divisions when he slotted home his side's third in their impressive triumph at Bloomfield Road. Holloway said: "I'm delighted for Brett. I'd like to thank Mr and Mrs Ormerod! I think what he has done for us in this match - I'm so proud to have been a part of it." He added: "His dad will probably say 'why aren't you playing him a bit more often?' I might have to if he keeps doing that." Inaccurate shooting and several last-ditch clearances were what kept denying Spurs a breakthrough, along with some superb saves from Seasiders goalkeeper Richard Kingson. When it was suggested to him that Kingson had looked "jittery" at times, Holloway said: "We're all a bit jittery - we're taking on one of the best teams in Europe and recently, when we've done that, we've let plenty of goals in. "I don't blame Richard at all. He is the only goalkeeper who has really been fit, the only one who has had to shoulder that pressure and no matter what he does, he is always confident. It might not go right, but he is always confident. "The other week he made a mistake against West Ham and then he did a Cruyff turn on the edge of the box. He keeps smiling. "Some of the defending (against Tottenham) wasn't quite right either and shouting and bawling at your keeper doesn't really help - we are all about encouragement. "We're all learning together and I'd like to thank him as well as part of my team."